Clint was second of the "star litter" to finish. 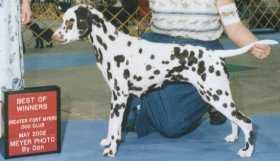 Pointed from the puppy class, his first weekend out, he also earned a specialty weekend major during the 2003 Heartland Dalmatian Club specialty weekend and a specialty reserve winner's dog at the 2003 Cumberland Valley Dalmatian Specialty. At the 2003 DCA National Specialty, Clint was honored with a win in the Bred by Exhibitor Class by Anne Rogers Clark. Clint finished both his US and Canadian Championships with BOB's from the classes. In August 2002, Clint visited Calgary, Alberta for the Dalmatian Club of Canada National Specialty. From that five show weekend, Clint returned home with 4 Best Puppy in Breed, 1 Best Puppy in Group, Best in Sweeps and Best Puppy at the DCC National Specialty, 8 points, and a BOB over 7 specials! Clint completed his Canadian championship the following year at the 2003 DCC National Specialty going WD/BOW from the Bred by Exhibitor class under breeder/judge Dr. Charlie Garvin. We couldn't be much prouder. Sadly we lost Clint late in 2016, at the ripe age of nearly 15 years old. He is deeply missed by the us and the Ascoleses.